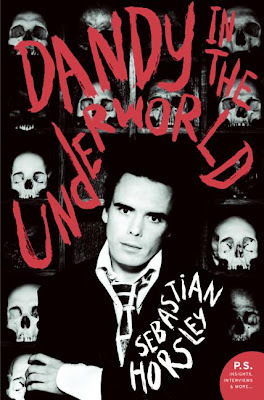 Author Sebastian Horsley was denied entry to the US on the grounds of "moral turpitude". Apparently, US Customs Googled him, read his book or checked his criminal record, featuring drugs and prostitution. Then again, it might have been his fashion sense they disapproved of: stovepipe hat, frock coat, freshly removed nail polish. All of this resulted in a six hour interrogation and a return flight to the UK. Welcome to America, Sebastian. Previous adventures include a bout of crucifixion in the Philippines in 2002, consumption of 100,000 pounds each of drugs (e.g., heroin, cocaine, ecstasy), prostitutes (e.g., transvestite, elderly, grimy, amputee, part-time, as roommates, as purchased by girlfriend), and suits (sixty-seven at one count). I've been recommending his autobiography to everyone I know. ... Can't Have an Eeenteresting Hairdo, I don't know what things are coming to. took the form of a "children's picture book for adults" (below). This step was necessary, [the plaintiff] wrote, because of "the Court's inability to comprehend" his arguments. This pleading, the justices fumed, contained pictures of "swastikas, kangaroos in court, a reproduced dollar bill, cartoon squirrels, Paul Simon, Paul Newman, Ray Charles, [and] a handprint with the word 'SLAP!' written under it." I fail to see what's so hard to understand. It seems the meaning is perfectly clear to anyone.